Look out Tilt Brush. There’s a new VR art tool in town. I think it’s pretty safe to say Adobe is the undisputed king of software for the creative arts. From photo manipulation and video editing, to illustration and animation the company is the number one go-to for anyone looking to create, well, anything. So it came as no surprise to hear that they’re finally taking the leap into virtual reality with Project Dali for the HTC Vive. The application works very similar to Google’s massively-popular VR drawing tool, Tilt Brush. Players are able to move within a three dimensional space and draw/paint using various types of customized brushes and materials. 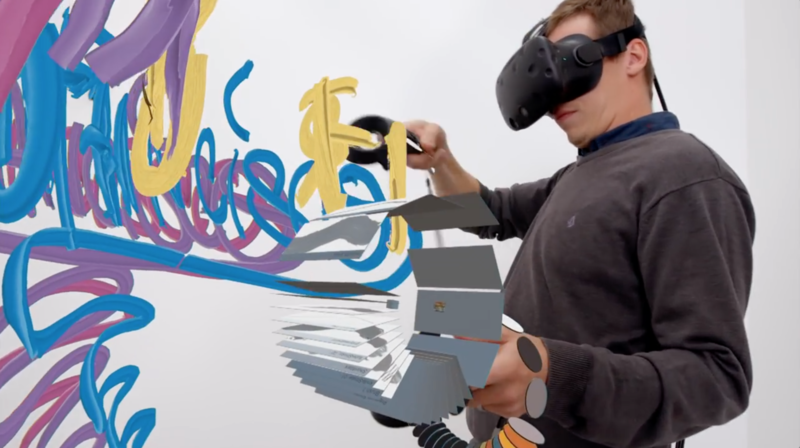 One hand serves as the ‘virtual canvas,’ while the other serves as the players brush, allowing them to draw and move around their 3D creations. Adobe hopes that this not only becomes THE standard creative canvas in VR, but that it will introduce a whole new form of art that blurs the line between digital and analog. While the market may already feature several VR drawing applications like Google’s Tilt Brush, Harmonix Music VR’s Easel and Facebook/Oculus Story Studio’s upcoming Quill, it’ll be extremely interesting to see what such an experienced art and design software company can bring to the table that others haven’t. After all, nobody makes better tools for making better art than Adobe. Where Tilt Brush shines with its gorgeous colors and approachable user-interface, Project Dali could potentially cement itself as the more advanced go-to option for VR professionals by offering a more complicated system of options and control. So far Project Dali has only been public at the Minnesota Street Project, but you can be certain we’ll be hearing much more about this highly-anticipated application soon.